"MBA marks a century of building community"
"How did we get into the housing crisis?" "Builders contribute more to the local economy than you might think"
"MBA marks 100 years with 100 community projects"
"What Built Green is and why you should care"
The year was 1909 and five builders met on an August night in the newly completed Central Building to discuss the burgeoning home building industry and its many challenges and opportunities. The population of the cities of Everett and Seattle had tripled in the previous decade and Seattle was now “on the map” with its Alaska-Yukon-Pacific Exposition. There were few building codes or restrictions on land use, and builders raced to build homes to keep up with demand. 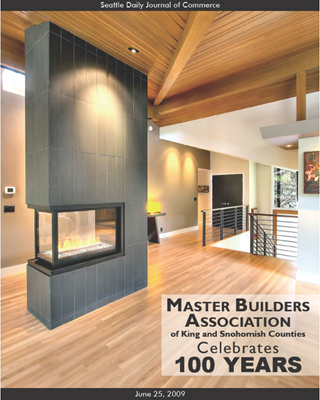 Twenty-three years ago, the MBA’s Remodelors Council crafted the Remodeling Excellence Awards, or REX awards, as a small celebration to honor the remodeling achievements of their fellow members. Their contemporaries today still celebrate the craftsmanship and innovations of the Puget Sound’s local remodeling artisans at the REX awards banquet, hosted every June. This year’s REX theme, “A Night of Brilliance, Elegance and Excellence,” offered a (faux) diamond-studded night of opulence as a fun distraction from the depressing recession-era mood so recently prevalent in the home building industry. The REX Awards banquet was held last weekend at the Lynnwood Convention Center. The REX Awards spotlight and recognize the work of the area’s top remodeling contractors in a variety of categories. A total of 64 entries were submitted for judging by a panel of non-association experts, consisting of local and national remodelers, media and architects. The 21 award categories ranged from remodels of bathrooms for less than $40,000 to kitchens and major remodels up to $600,000. They also recognized remodeler specialties such as interior design and landscaping. New to this year’s REX awards was the category of Universal Design. This award was created to honor exceptional design work that is accessible by all people, to the greatest extent possible, without the need for adaptation. As the baby boomer population ages, such design is particularly important and will likely only grow in relevance. The inaugural award went to Stewardship Remodeling of Duvall for an outdoor living project featuring covered parking and gardening sheds. In all, 16 remodelers walked away with awards from the event, with Seattle’s Dyna Construction winning three awards and Seattle’s Gaspar’s Construction nabbing two. 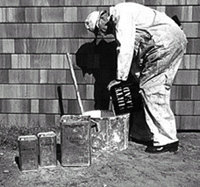 The REX Awards is one of the activities of the Master Builders Association of King and Snohomish Counties. This home remodel, by Dyna Contracting, was one of 21 REX awards given by the MBA’s Remodelors Council.